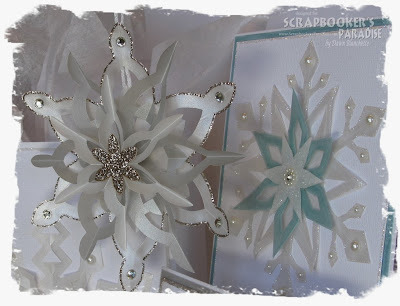 For more details, a complete list of supplies, and more snowflake projects, please pop on over to my Showcase Monday post at Scrapbooker's Paradise. WOW! These are stunning Dawn, the snowflakes are so pretty and delicate and I love the added sparkle. This is gorgeous Dawn! Lots of snow here too so snowflakes seem like a pretty good theme at the moment. Now I'm off to check out that template. I've already popped over to admire your amazing snowflake display, Dawn! I wanted to leave a more personal note on your blog - but this is simply beautiful, and much appreciated from someone in Florida LOL We have been having much warmer than usual weather again this winter. I don't want to complain at all because of the terrible destruction weather has been wreaking everywhere else. It's still humid and we STILL have our AC on! Usually by now our nights are in the 40s-50s and days only in the mid 70s. But temps are higher. If the rabbits would leave hubby's garden alone, we'd have a great harvest this winter! Take care, and enjoy a little snow for me. I bet you could have waited! A friend of mine is up in Northern AB & it`s been what, -29 this week...and it`s not even winter yet. YIKES. I just can't get enough looking at these beauties. So gorgeous Dawn. Keep smiling and creating.